My wife and I have just returned from a trip to Belize. Kind of like a 2nd honeymoon, so we spent most of our time on the coast and in Belize City. It was very enjoyable and I recommend Belize as a vacation spot. We used one of our days to visit Xunantunich, the ancient Mayan ruins west of Belize City. I am into the paranormal and like to visit historical sites known for strange activity. Xunantunich is Mayan for 'Stone Woman.' In the past, there have been sightings of a woman, dressed in white, ascending the stairs of the El Castillo temple-pyramid. She is said to have red eyes and disappears within the stone walls of the structure. We had hired a private guide who told us that some people believed that the Stone Woman had been sacrificed and that she appears when the energy is high at the temple. He told us that in his 15 years as a guide that he had briefly seen her once while with a tour group after someone pointed her out to him. He said the woman was dress in a long white traditional tunic and that she had black hair. He later took us to the spot where he had seen her. As we stood on a grassy ledge on the temple, there was a loud crashing sound coming from the jungle below us. We could see small trees being push about as this thing moved through the thick vegetation. I looked at the guide and he had a confused and fearful look on his face. He said that we need move in the opposite direction. We descended the steps and walked quickly towards the plaza area where the tour Jeep was parked. When we reached the vehicle, he made a call to someone on his radio. I don't speak Spanish, but my wife said that it sounded like the guide said 'cow.' Well there is no way all that noise was caused by a cow or even several cows. We got into the vehicle and waited for the driver. After a few minutes, he arrived and we headed back to Belize City. I asked the driver about what we had experienced and if he had any idea what it could have been. He said he wasn't familiar with any animal that big in the jungle. To me, it seemed he wasn't being completely honest, but I dropped the subject. 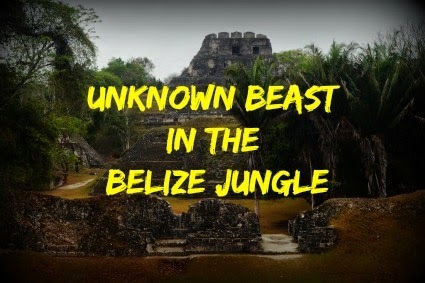 The next day, I got online to see if anything that big was known to inhabit the Belize jungles. I found a brief mention of a 'cave cow', a type of legendary large ground sloth that was said to live there. That's all I found. Since my wife thought the guide said 'cow' when he was on the radio, that may be what he was referring to.